“A new pioneer settlement was begun on July 21, 1878, when William J. Flake led five families, their wagons and livestock into this valley. Lucy Flake described the scene as “a beautiful place” with “clear water” and “hills covered with green grass.” Within weeks, destitute families began drifting in. Friends and strangers shared the small four-room adobe home sold to Flake with the land, and worked to harvest the crops on the newly purchased ranch. 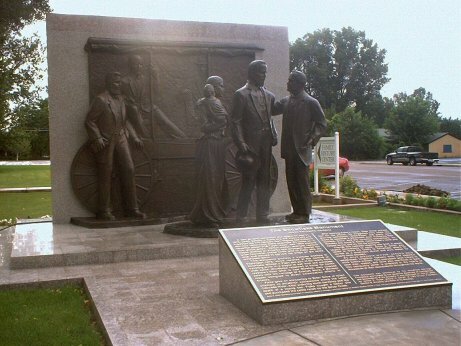 This monument portrays a trailside meeting in September 1878, which resulted in the naming of Snowflake. William J. Flake and part of his family were traveling north in a wagon to sell wool and purchase Utah cattle. Near what is now Winslow, they crossed paths with the carriage of Erastus Snow, a Mormon leader assigned to direct colonization efforts in Arizona. Flake gave an accounting to Elder Snow of failed attempts to establish settlements along the Little Colorado River. After enduring much hardship and the death of a young son, Flake sought a better site and purchased the cattle ranch on Silver Creek. After hearing Flake’s report, Elder Snow praised him for his efforts. He suggested they name the growing settlement “Snow-Flake,” and plans were made to establish a permanent town. Following their meeting, Snow and his traveling companions, Ira Hinckley and Jesse N. Smith, visited Flake’s ranch and helped survey and lay out the townsite. Though this roadside meeting was brief, it would impact generations to come. Jesse N. Smith was called to move his family to Snowflake, where he served as a prominent church and civic leader for nearly three decades. Visit this link – http://www.jerrystewart.org/snowflakeaz/index.html – to find out more about Snowflake, AZ.